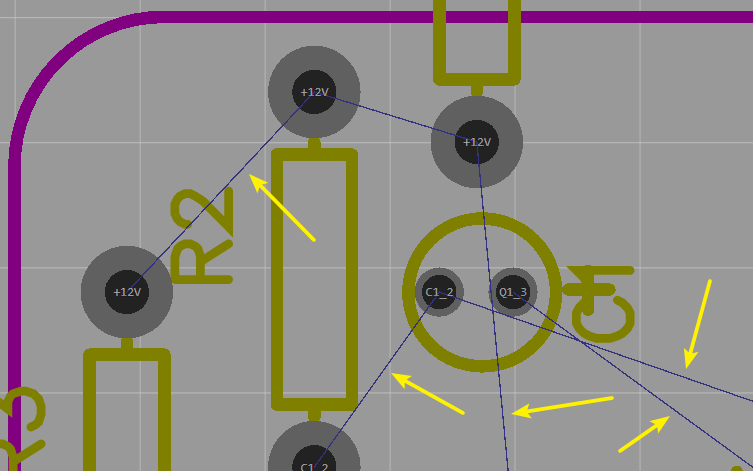 When you lay the track in the PCB, Between PIN and PIN as they have the same net name, a Ratline will be automatically shown among them to reveal that they can be connected with a track. If you still draw a track in +12V after deselecting, canvas will not display this track , but it will show a text with +12V as below. Based on this skill， you don’t need to lay GND net before copper area in the PCB. If you want to check the ratlines with highlight, you can click the pencil on the Ratlines Layer as below, and you can change the ratline’s color.